In November 2017, we held the NIISQ Photographic Exhibition and were honoured to receive submissions from many individuals sharing their stories about life after serious personal injury. The winning photograph, Kintsugi: The New Me was a close up self portrait of Shane Daley who lives with a traumatic brain injury. The creative concept adopted by Shane in his photograph brought visibility to a usually invisible injury. Read our interview with Shane to learn more about Shane’s lived experience. The interview is found within our February 2018 newsletter. Subscribe to the NIISQ newsletter to receive updates from NIISQ. 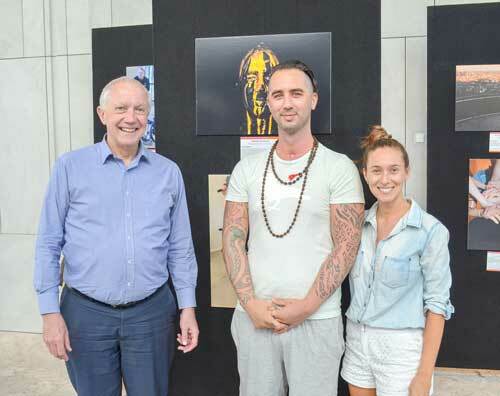 Left to right: Neil Singleton (NIISQ CEO), Shane Daley (Photographic exhibition winner) and his wife Liesl.